The Networking Activity “Standards and Protocols” (N7SP) aims for harmonization of different processes and documentations concerning the data acquisition and campaign management within EUFAR. 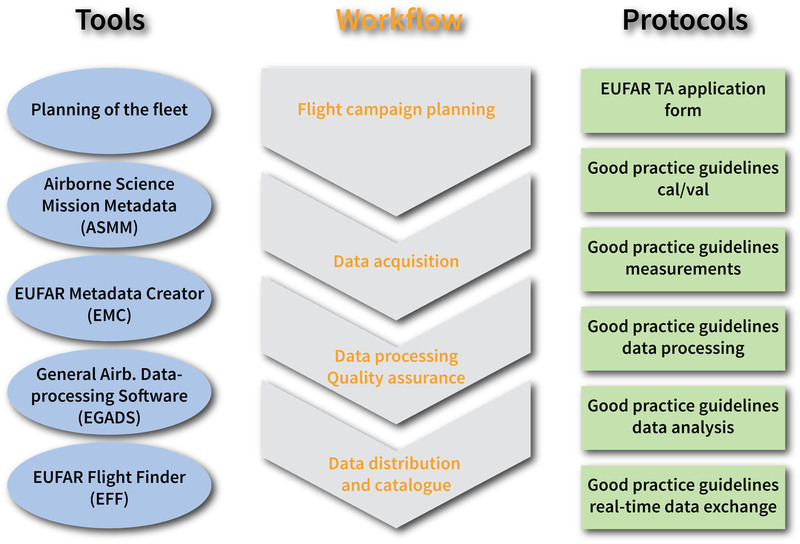 The overall suite of EUFAR’s airborne data is addressed, ranging from atmospheric research to Earth observation including in-situ and remote sensing airborne data. the Airborne Science Mission Metadata creator (ASMM), which can increase the value and search ability of a dataset by including a complementary set of metadata, based on the flight situation or the atmospheric conditions. The activity also keeps track of existing open-source toolboxes, which would be relevant for operators and users within EUFAR. In order to ensure the implementation of those recommendations in the EUFAR community, the N7SP team accompany all EUFAR members, via the EUFAR website, meetings and training courses. To develop, expand and implement common protocols for airborne surveys and airborne data handling in consensus with international initiatives towards standardization and harmonization. To support users and operators with recommendations on best practice and state-of-the-art software for airborne data pre-processing and further analysis. To develop, maintain and publish open source software toolboxes for higher level data products, and data analysis. To define and help implement standards for data transfer in real-time.